Lighting a Fire: New Year Pinterest Ideas! 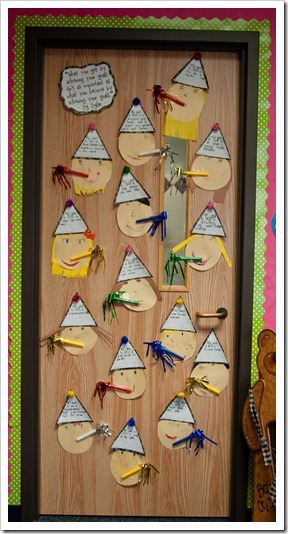 I know, I know, it seems like New Year's was SOOOOOO long ago--but, I wanted to post and share some of the cute projects I found on Pinterest! Since I work with third graders- I thought that they would be capable of cutting out a circle for their head and a triangle for their party hat without much assistance. I was wrong on both parts- BUT after a couple of trips to the scrap bin- they all had a circle and triangle! I knew that my next step was going to be very tricky for them but we learned from our mistakes and they cut out another triangle shape from lined paper to write their resolutions. Then, they drew on their face using crayons or markers and used tissue paper to decorate their hats! It all took about a half-hour/ 45 minutes and was a fun getting to know you *again* activity! I loved their resolutions! "Do something without being told"...hmm, I wonder if she means chores, this kiddo probably does a lot without being told! "Be nice to Ellie and Jack Jack" her niece/nephew that she lives with - I think that might be a tough one! 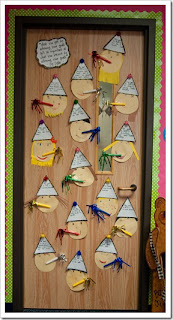 For this project, the students were given a construction paper copy of the hat and mittens. They used oil pastels to decorate their hat and mittens in a coordinating pattern. We then glued the hat and mittens in to place and used an oil pastel to outline our face, arms and jacket. The students continued their pattern on their sweater/scarf, added the adorable face (I love the rosy cheeks) and snow. They turned out so cute! I added a winter poem to the poster sized paper that students wrote and typed. The idea for the poems came from a scholastic poetry book I bought a couple of years ago. I searched the site but can't find it- and of course- I can't remember the title! ANYWAY! The form of the poem is basic: Winter (verb) in with (blank) and (blank)...it is fun reading what the kids came up with! Needless to say this is a Pinterest idea that I will be continuing with year after year. It was so cute that my other third grade teammates did it with their class! Those are too cute. I can see why they've been in the hallway for so long.